Thanks to @Featherweight_ for the awesome artwork of my character shown above. And to @Lord_Hosk for making the request for this drawing. Hey everyone! So bright and early tomorrow (Saturday, October 26), I’ll be playing Dungeons & Dragons with the Wizards of the Coast D&D team, all to raise money for children’s hospitals. 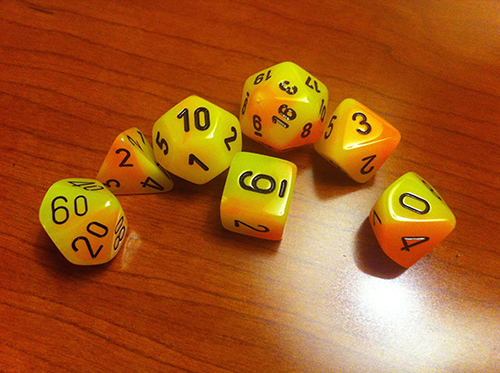 The game (and our indefatigable dungeon master) will be going for 25 hours (daylight savings, woo!). I’ll be playing for the first 8 hours of that, starting at 8am PST. You can watch the livestream of our game right-here-click-here. You can donate to my efforts throughout the day, or to other members of my team. Wizards of the Coast will be doing some great prize giveaways to folks who donate throughout the day tomorrow, and you can learn more about that by tuning into the stream. I also have some things to give away. 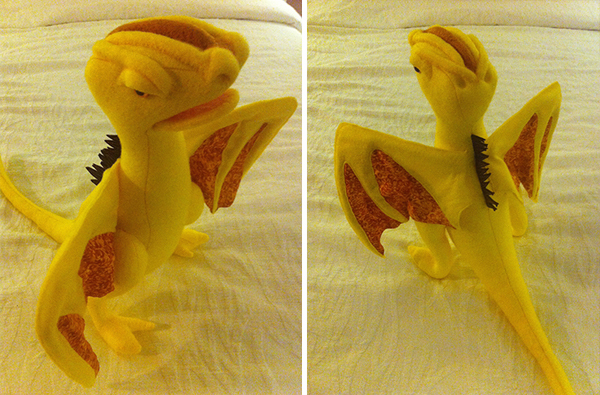 I’ll of course be doing a draw after the game to give away Binky the pseudodragon to someone who donated towards choosing his creature type. Also, anyone who donates $50 or more will get a homemade postcard from me after the game, with a note written in the voice of my character sending word of her adventures from the road. But what if you haven’t donated already, or you can’t afford to do a $50 donation? Well, I have an opportunity for you to win something too! For one thing, everyone who donates any amount to my campaign will get access to a delightful photoshoot of Binky the pseudodragon, in the same vein as things like my trip to the playground with 50 dimetrodons, my shoot kobolds being eaten by a baby, me being eaten by Creepy Dolls, or the adventures of two furball cavemen and a cat. Secondly, I’m going to give away some things from the game day. My dice, specially purchased for the occasion (note that they match Binky’s colours), my character sheet (which may be covered in all kinds of messy scribbles and doodles after 8 hours of gaming) AND a very special dice bag that I made just for the occasion. 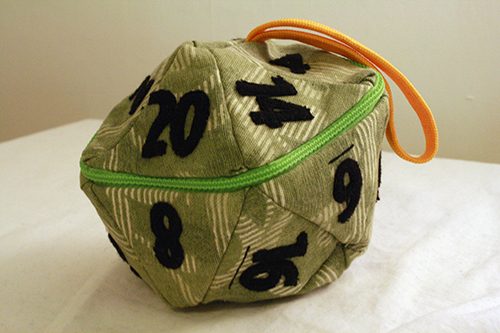 A dice bag that looks like a D20, a D20 that zips open to hold all your smaller D20s. I will draw a name from everyone who donates $5 or more to my campaign during our game day, on October 26. 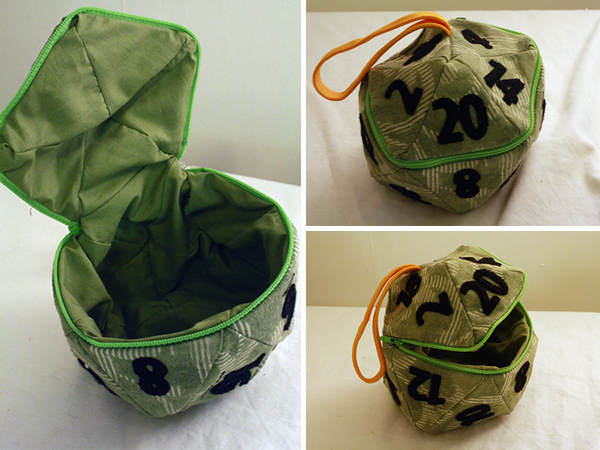 Donate tomorrow for a chance to win this sweet bag, dice and a messy character sheet! 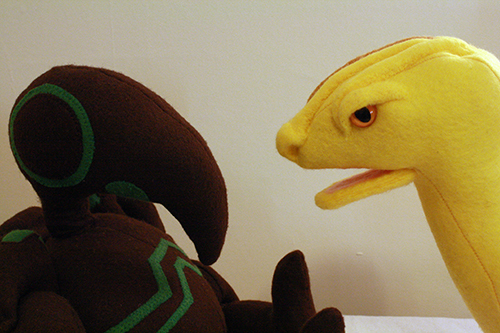 Your donations have determined many things about who my character is. I’ve filled in the remaining gaps, and here are the final results. 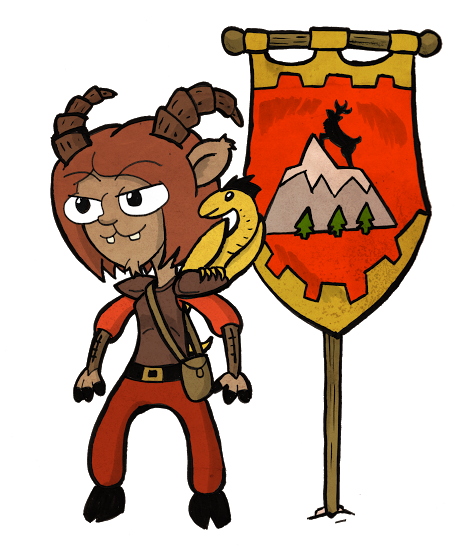 My name is Generic Hero of the High-Elk Clan, and I am a weregoat (like a werewolf, except part human part goat) monk. Though my clan is of utmost importance to me, I am driven by wanderlust and have journeyed far and seen much. 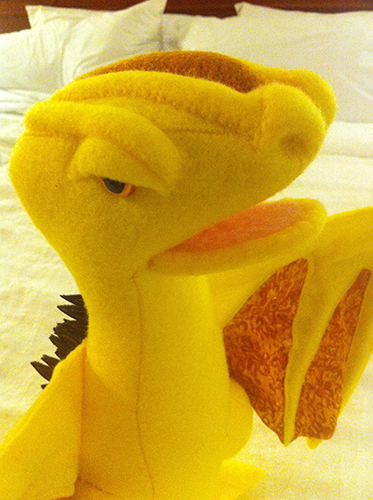 In my travels I befriended a young pseudodragon named Binky, who now adventures with me. I also became a loyal servant of one Lord Mathias, and now seek out opportunities to do good deeds in his name. I you go out of my way to help children and others I percieve as defenseless, but while I seek to protect others, for myself I feel that there is no room for caution in a life lived to the fullest. Oh, and I have a wondrous item: a Gem of Brightness. I also have a theme song, which you can read in full at the bottom of this post. Great innovation in the post for me! I have read this and could desire to attempt and continued it in a better way. Most enticing blogs I’ve ever read and this is what it should. Must be shared as well. I was really bored but your blog lightened up my day..